There is a tradition in schools taught by the Jesuits that each new school year is begun by a mass dedicated to the Holy Spirit. It is a time to bring the community back together, to unite our newest members to our community, and to rededicate our lives to God. The Mass of the Holy Spirit is kind of a big deal, and I certainly couldn’t imagine coming back to Spring Hill without attending it. When I was a freshman one of the first things my parents did after moving all my stuff into my new dorm was to go find campus ministry. They wanted to greet the people who they had known from my brother’s time on the Hill, and to meet any new members of the staff who had recently joined the family. Of course, they had to mention that I was an altar server/Eucharistic minister/lector. And of course, as soon as Billy (the head of campus ministry) found out, he asked me to altar serve at the Mass of the Holy Spirit. How could I say no? As long as I wasn’t doing it alone, I knew I could do it. I’ll never forget the feeling I got when I stood at the back of the church, cross in hand, ready to lead the procession through St. Joseph’s Chapel. I was so incredibly nervous that I would mess something up and look like an idiot. As the music started, I glanced back at Father Salmi, who nodded, and I began to walk. It was at that moment that the choir began to sing, and I felt almost overwhelmed by the beautiful acoustics and voices. It was something that I hadn’t expected. It instantly gave me a feeling of awe and respect, and something told me that the next four years were going to hold more for me than I could ever imagine. I felt an immediate connection to this community that was gathered together in God’s house, the body of Christ proclaiming His glory with one voice. I knew that I was home. I don’t know where these past three years have gone. I can remember that first mass as if it were yesterday. But when Billy approached me for the fourth year in a row to serve at the Mass of the Holy Spirit, I knew that there was no way for me to say no. As I stood in the back of the church, dressed in the same white alb and carrying the same beautiful cross, it occurred to me that I’ve come full circle. I was no longer walking down the aisle as a scared and nervous freshman, but as a seasoned and confident senior. I knew many of the faces in the church looking back at me. I not only knew all of the priests by name, but they had all remembered mine. Several of them, without even missing a beat, had asked me how my time in Manchester had gone. They didn’t have Facebook to keep up with my travels, so the fact that they even remembered where I had been meant a lot. Most Spring Hill students that study abroad go to our center in Italy, so it is often assumed that when a student is gone for a semester abroad, obviously they are in Italy. But no, the Jesuits remembered. That’s what it means to be a family. There’s something special about coming home. It’s certainly true that home is never the same when you leave and return, but that doesn’t make it any less of a home. As I carried the cross down the aisle, I was flooded with memories of that same walk from freshman year. It was enough to almost make me cry. How much has changed in the past 3 years! I thought of the faces staring back at me, the faces of new badgers who I hadn’t met yet, and the familiar faces of friends I had yet to greet. I realized that no matter where I go, who I met, or what I do, Spring Hill will always be here. It’s part of the Spring Hill spirit. As I carried the cross down the aisle, I realized that I was a bundle of nerves, just like I had been freshman year. But each time was subtely different; freshman year I didn’t know what to expect from college, and this year I realized that I didn’t know how I was ever going to be able to say goodbye to the Hill. I had been so ready to start college, and suddenly I felt extremely unprepared to leave. Not because I haven’t learned skills to succeed in “the real world,” but because I can’t imagine leaving this behind. I’ve only just gotten back. And I’m determined to enjoy this last year as much as I possibly can. The Hill is always changing. This year there are almost 450 new faces in our community. There are new organizations, new teachers, new trees and new random statues. But St. Joseph’s chapel has been standing there for over 100 years. The Jesuit presence has been on this plot of land since 1830, forming students in mind, body, and spirit, and teaching the ideals of faith, justice, service, and learning for life. The heart of the Hill doesn’t change. The Hill is always here to welcome its badgers home. 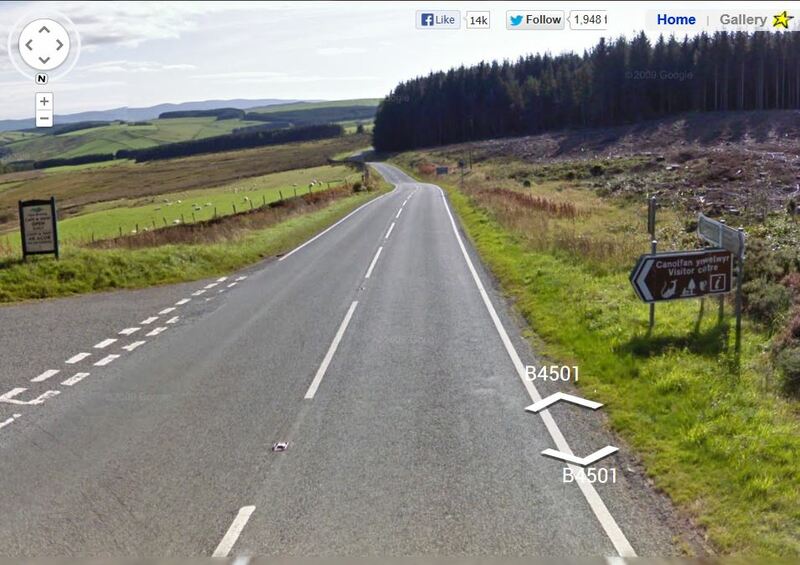 Maybe I’m arriving a little late to this game, but apparently there’s been a game floating around Tumblr known as the “MapCrunch Airport Challenge.” Basically, you can go to mapcrunch.com, and it has the ability to drop you anywhere in the world by using Google Maps Street View. If you click the “stealth” box, you can hide your location so you don’t know where you are. What’s the point of seeing some random street in a country you’ve probably never been to? Your goal is to find your way to an airport, from which point you can find a way home. The problem is that you can’t stop and ask for directions, you can’t access every single street (only those photographed by Google Maps), and you might not understand the language of the street signs in a given country. And did I mention that it’s completely random? You could end up in the middle of nowhere. It’s almost as if you literally were dropped off, blindfolded, into a random pinpoint on the globe. Sounds slightly terrifying, doesn’t it? Well to me, the idea sounds absolutely fantastic! When are they turning this into a reality show? Because I’ll sign up in an instant! As soon as this idea was presented to me via Pinterest, I had to try it. My first attempt I was dropped in Singapore (which I found out later, after Google searching) and I think I actually did find the airport. I found Airport Rd, and signs that warned of “low flying airplanes,” but then I couldn’t go all the way to the end of Airport Road. 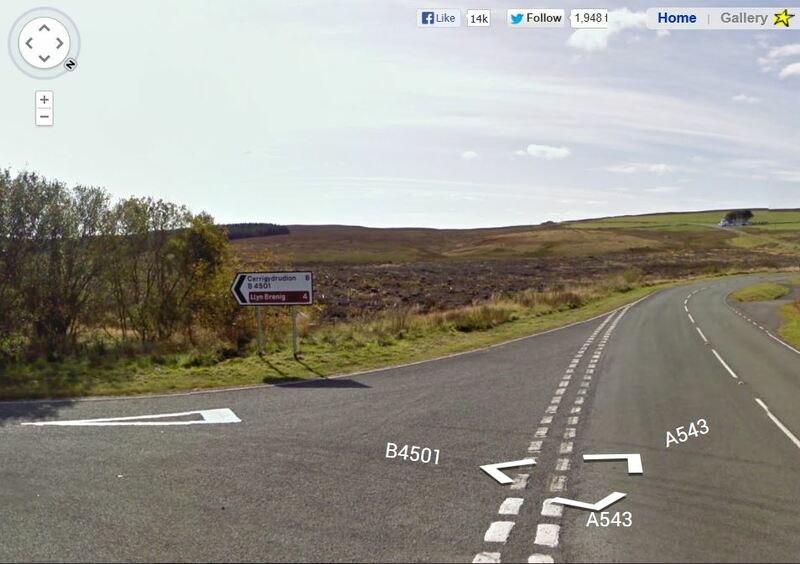 The Google Street View pictures ended. So I have to assume I was on the right path. How long did it take me? Approximately 3 hours. The second time I was a bit more strategic in my approach. 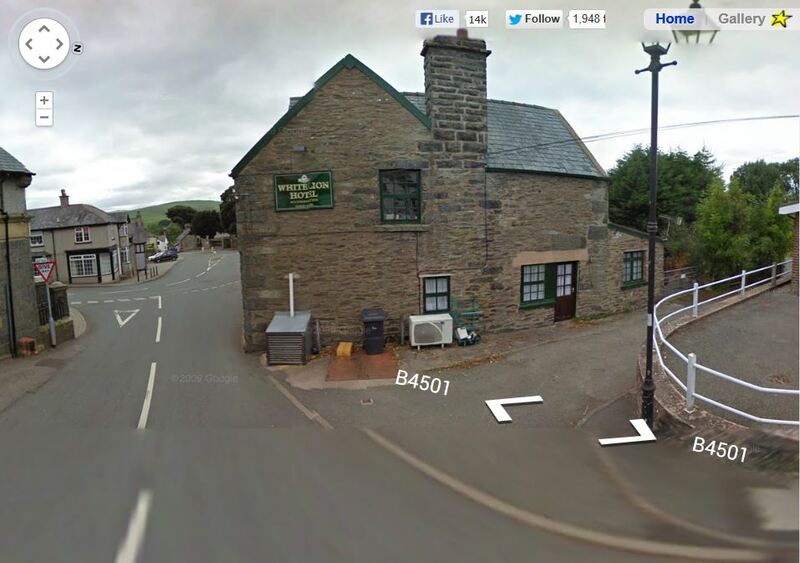 I also knew where I was (vaguely) from the moment I was “dropped down.” This time, I ended up in Wales. 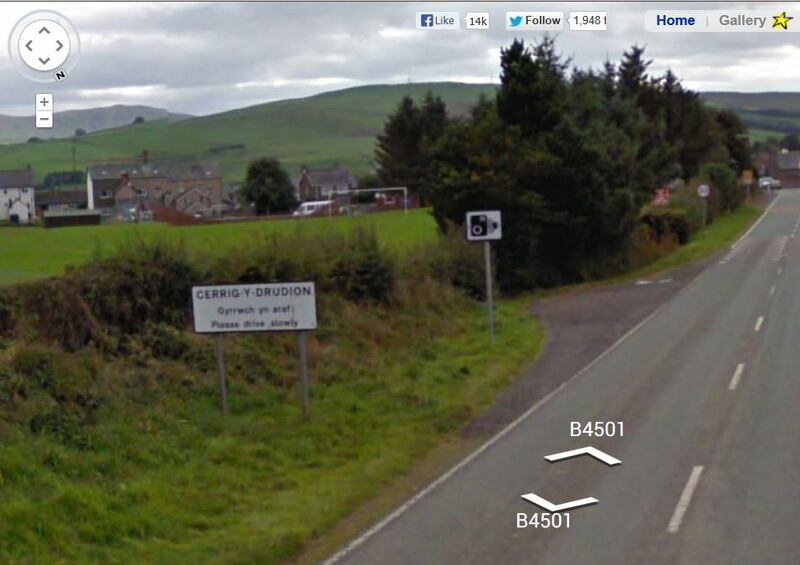 I know this because I’ve been to Wales once, and I know that the street signs are all in both Welsh and English. Welsh is a pretty distinctive language. Also, the moors, little stone walls around pastures, excessive amounts of sheep, and lack of cities also gave it away. It was distinctively part of the UK. That much I knew. This is roughly where I started. I only thought about it after I had started on my journey that I should photo-document this one, so I backtracked to approximately the spot I began at. 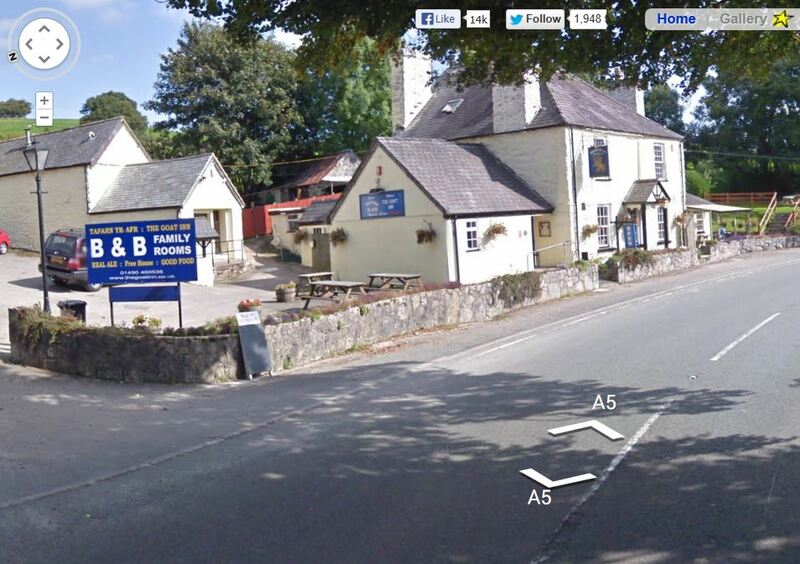 But this is the lovely town (*cough* village) of Llanfair Talhaiarn. As you can see, I clearly have a lot to go on at the moment. 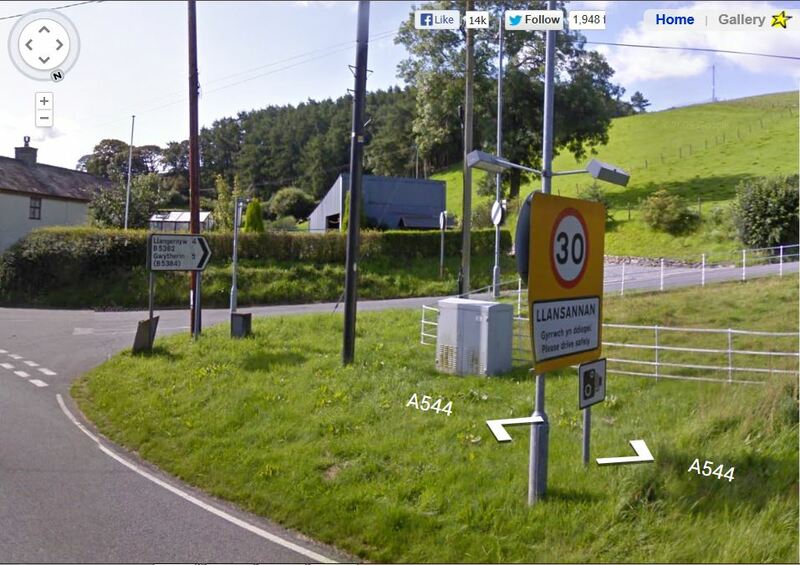 I followed signs for Llansannan, because it sounded like a major city. It wasn’t. I debated turning at this street, but quickly realized that the street looped around to go back in the direction that I had just came from. So I just kept going south. The road I was on came to an end, but it met with another north/south road. Again, I took the south-bound route. 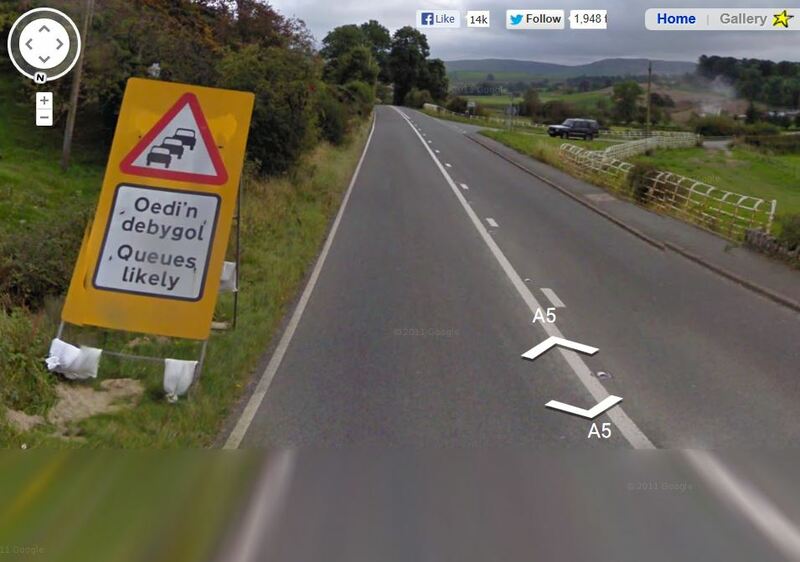 Still hoping to find signs for Cardiff. Or Caerdydd in Welsh. Either or, I’m not picky! Llyn Brenig. That looks like it’s a major city, right? It’s highlighted in brown. It must be important. And that road also goes south bound. Time to take a left. Welcome to Llyn Brenig. Still no major city. There is, however, a Visitor Centre. I could stop there to ask for directions! Except wait . . . no I can’t. 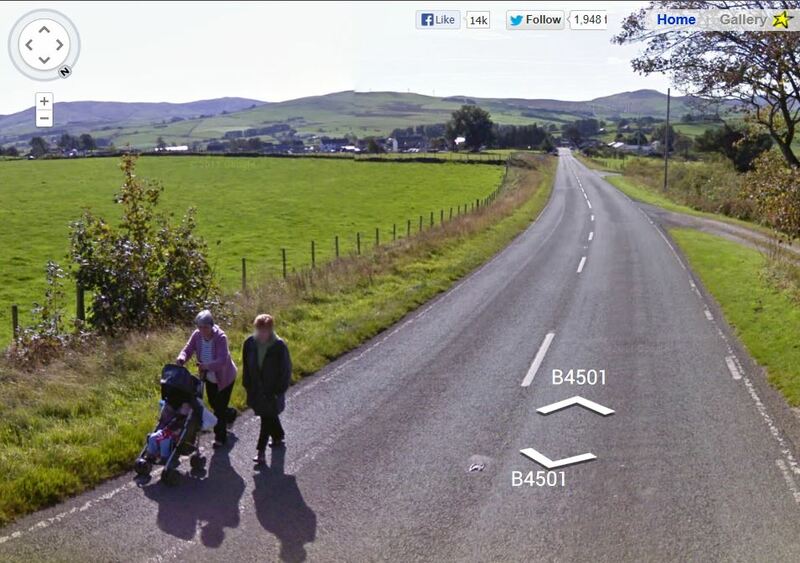 I bet I could ask this nice looking family for directions . . .
Oooh yay, a slightly bigger town! Looks promising. Well, I might not have found an airport, but I found a hotel. And at that point it was actually time for me to go to bed. 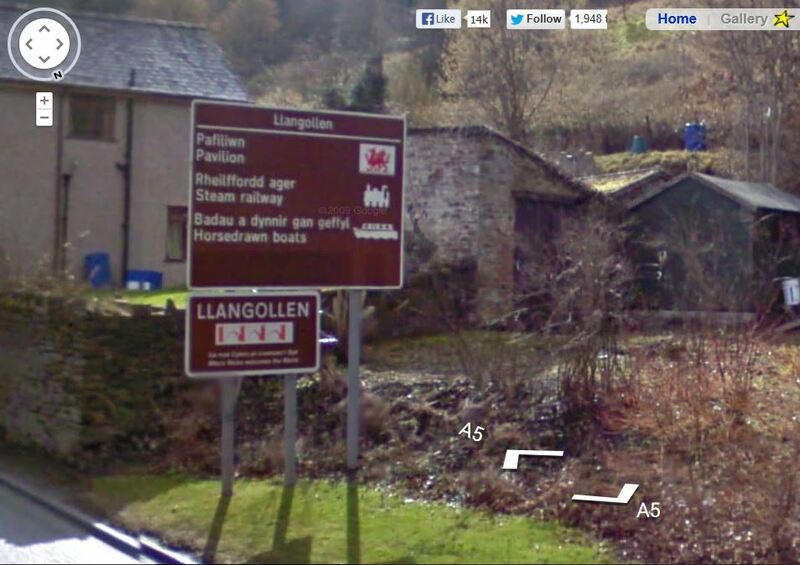 So if this were real life, and I had actually been travelling through Wales in real time, then this would be the perfect place to stop and sleep (and ask for directions). Guess I’ll continue my journey in the morning! So the next day I picked up where I left off. But just beyond the hotel you can see there is a crossroads. The B4501 ends and meets with the B5105, and I had to decide to go left or right. Let’s look at what the road signs say . . .
Hmm, the nearest town is 12 miles away. The next nearest is 20. 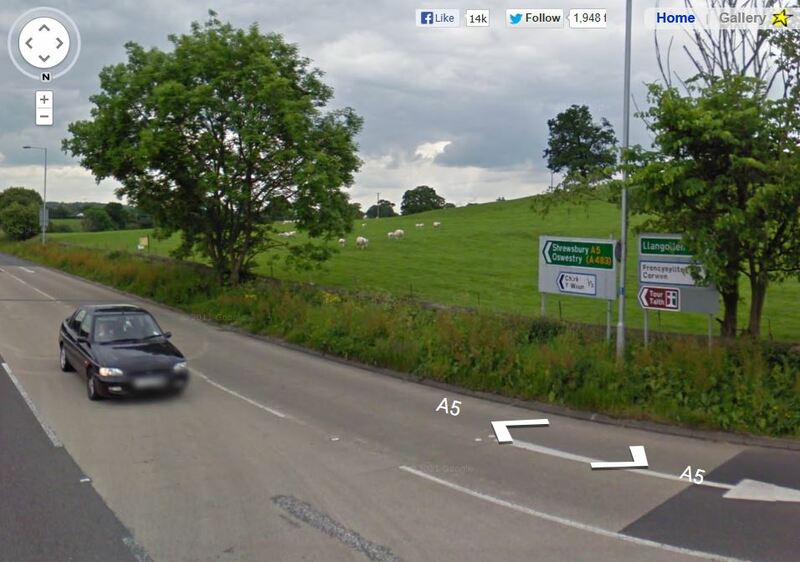 But the A5 sounds like a major motorway . . . Awesome. 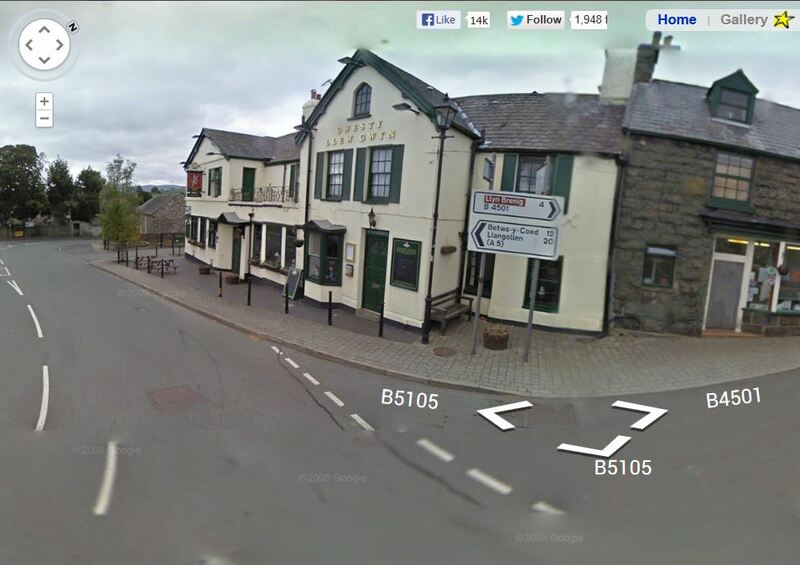 I’m fairly certain I passed signs for Betws-y-coed a long time ago, so taking that route would probably be backtracking. 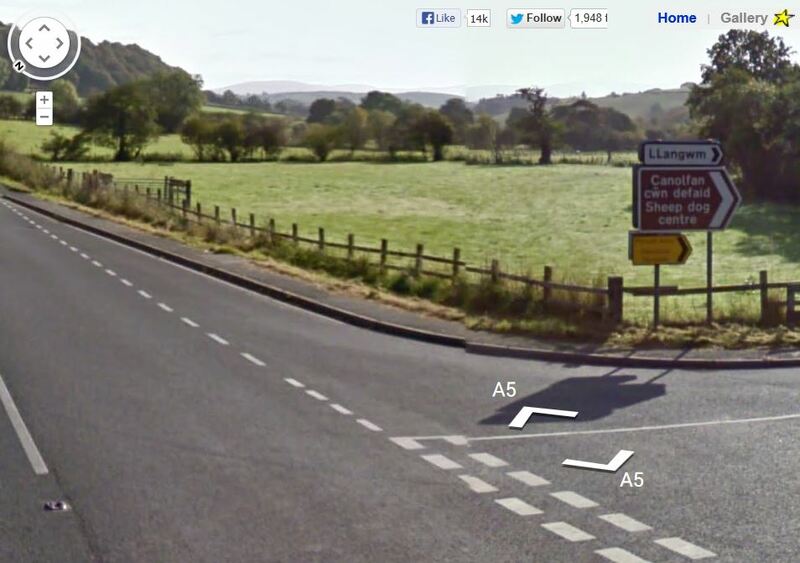 Time to take a left towards Llangollen! Found a cute pub!! I would totally stop there in real life. And they have cheap fish and chips! I miss real fish and chips . . . Although apparently I’m in the middle of nowhere. Great . . . But this sign made me laugh. Gotta love the UK! 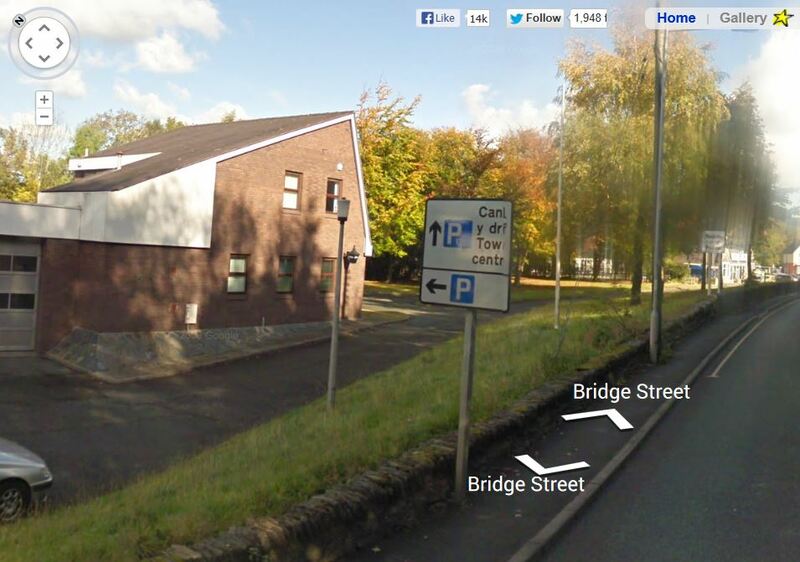 What is a sheep dog centre anyway? And what I don’t understand is how all of these pictures seem to be taken on beautiful, bright sunny days. Like, how does that happen?? Does Wales have a different climate than the rest of the island? Or did Google Maps literally waste weeks in the UK just waiting for that one beautiful sunny day to say “Ok guys, let’s get out there today and drive as much as possible!” I mean, I’m certainly not complaining. The views are gorgeous! And can you say precious?? If it wasn’t the middle of the day, I might suggest we stop here for the night. And then whoa! What is that? 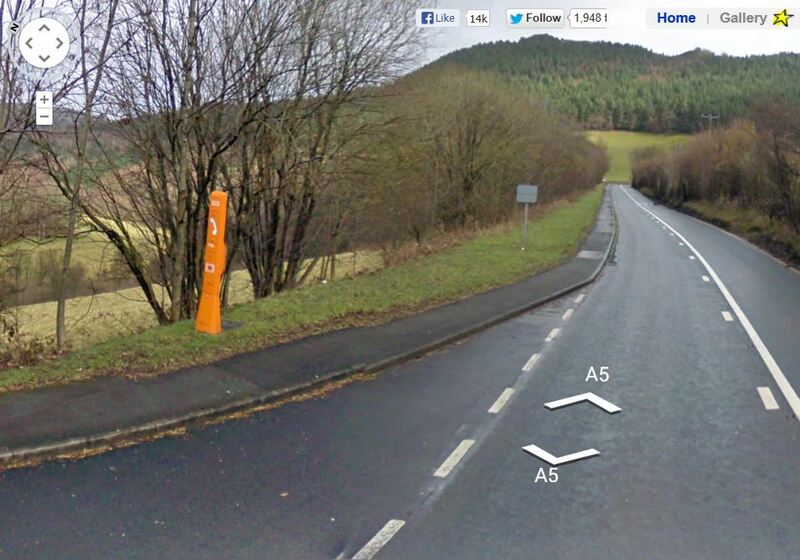 Oh look, it’s the first actual traffic light that I’ve encountered in Wales! I also noticed at this point that I’ve stopped going south, and am going almost due east. That isn’t really a problem though. East will bring me closer to England. Where there are more cities, and more major roadways. This wouldn’t mean much to most people. Except that Chester is a city in England. The International Society that I was a part of in Manchester did a day trip there once, but I didn’t go with them on that trip. The problem is that the road goes back north. I feel like not only would this be backtracking, but Chester is (probably) a lot farther away than Cardiff. Although who knows at this point? So do I take the chance and go towards a city I recognize? But then again, is there more than once city named Chester? I think the one that I remember is a lot farther north in England that Wales is. That would probably be a pretty far trek. Hmmmmm….. 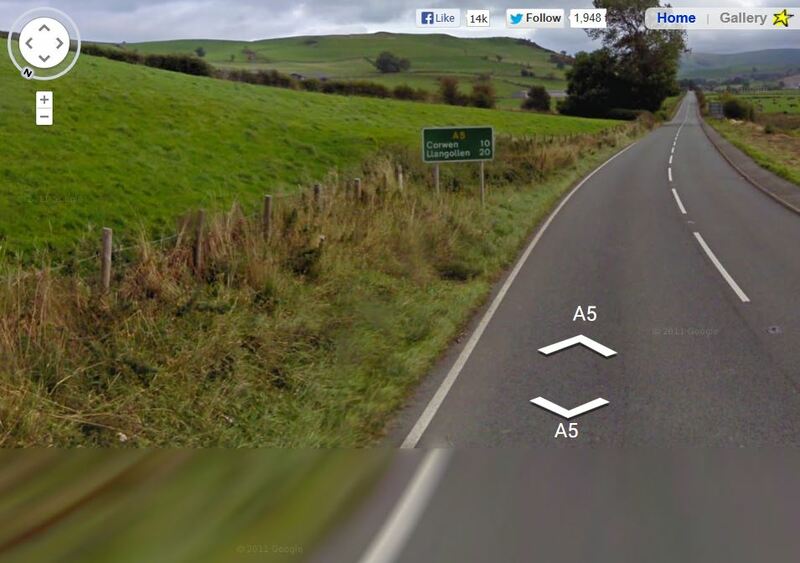 I think I’m gonna take my chances and continue on the A5. Now I really have a decision to make though. 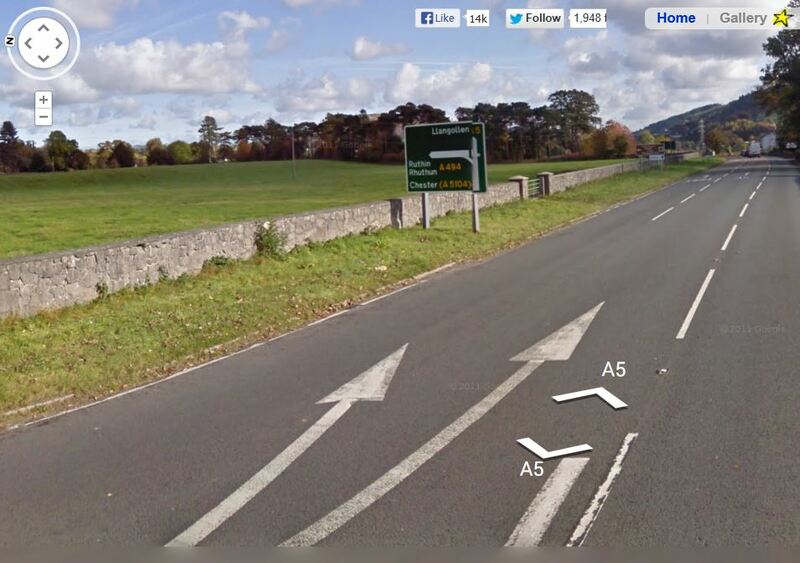 This road goes in a more southerly direction. 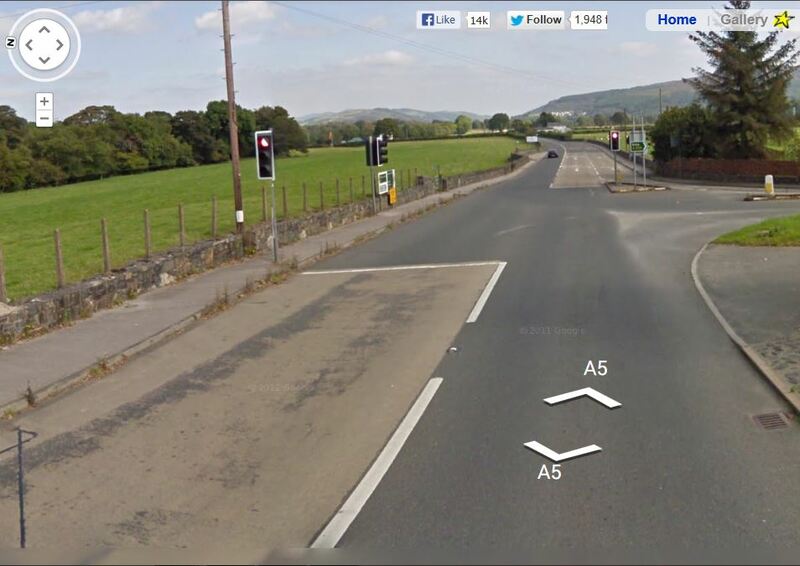 It’s not as major a roadway as the A5 (although how many major roadways are in Wales to begin with? ), but it comes to some towns fairly soon. And a campground, or something like that. 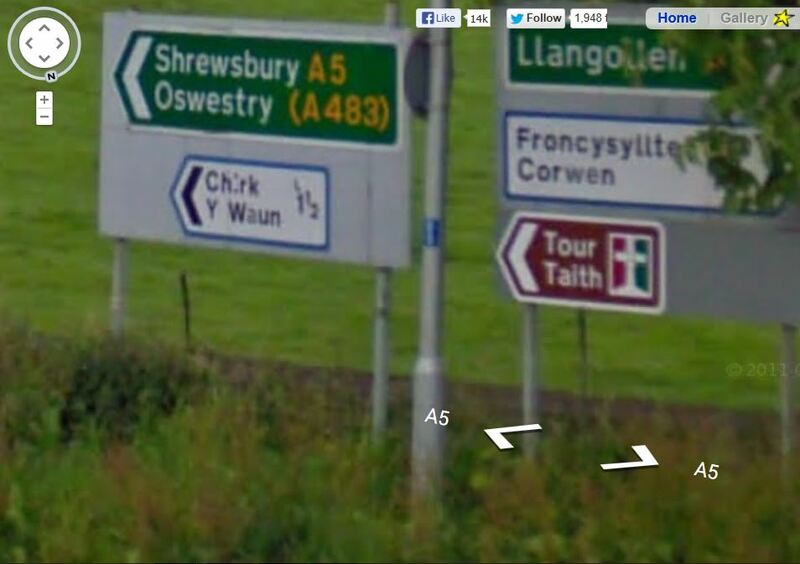 My gut is really telling me to stay on the A5 though . . . 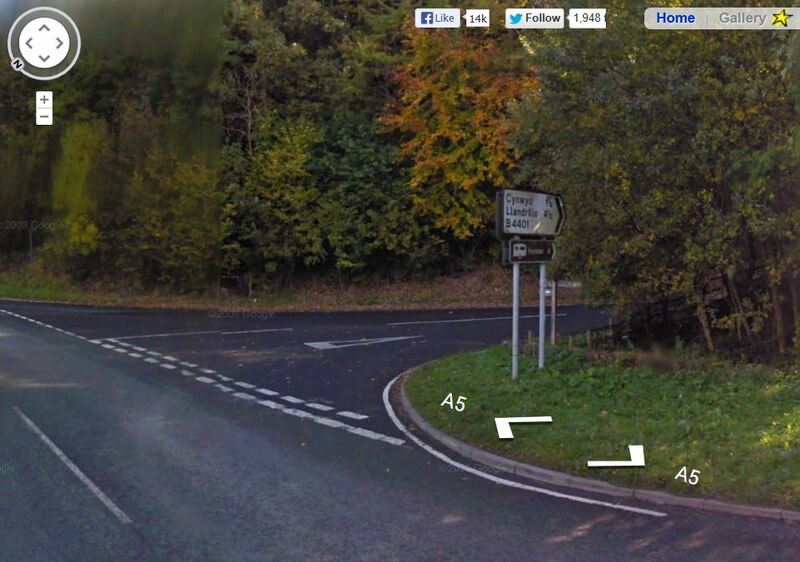 But then the A5 turns into Bridge Street. And then I see a sign for a “town centre.” The town must be big enough to have a centre….that’s a good sign, right? 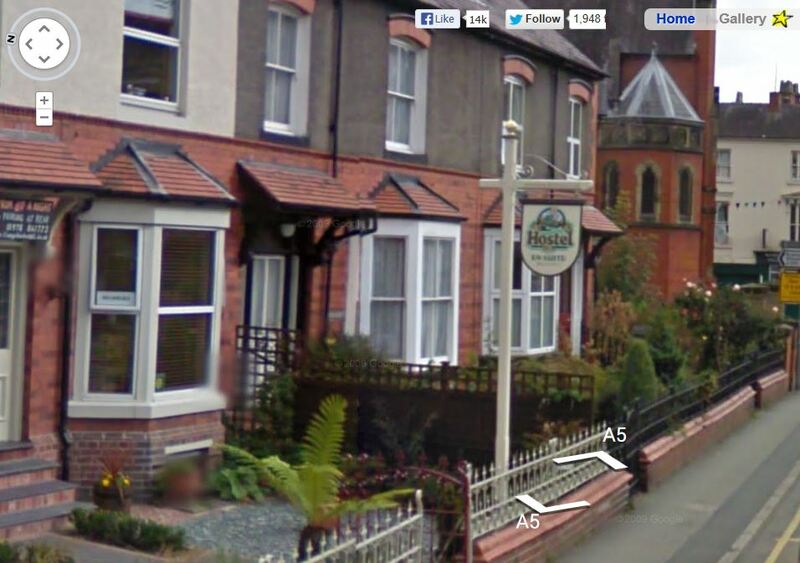 I also passed about 5 Bed and Breakfasts on the Holyhead Road. I would love to actually stop at one. Do you know what this means?? There’s a train station! 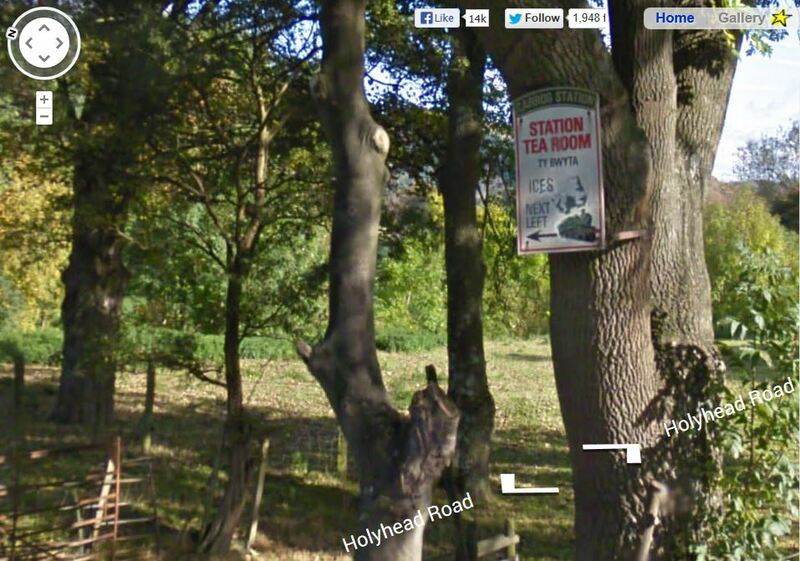 With a tea room! I can stop for tea, and catch a train to the next major city with an airport! Except the game doesn’t quite work that way . . . 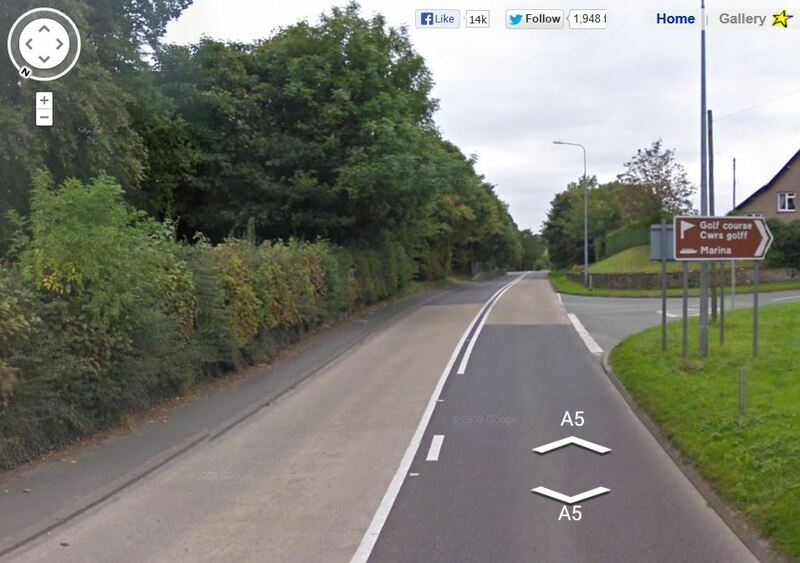 But Holyhead Road turned back into the A5, as I had hoped it would. And I continued to follow it. It brought me back south again, and then back east, and it went back and forth like that for a while. But I realized ultimately that I’ve been going east for far too long. My chances of getting to Cardiff are pretty slim at this point. Oh hey look, an emergency phone! I could totally use that! But oh wait . . .
It’s okay though. I made it to this city of Llangollen. Apparently it’s a big deal. They have a steam railway AND horse drawn boats. Can I stop here? Pretty please? A little sightseeing tour? I also saw a sign for whitewater rafting back up the road a ways. Sounds like a cool place to stop! And hey y’all, I found a hostel! But as the buildings started to get farther and farther apart, I decided to turn around and go back to follow signs for the Town Centre. Maybe there would be more major roads intersecting in one place? Let’s follow signs for the train station. If all else fails, I could give up at the train station. 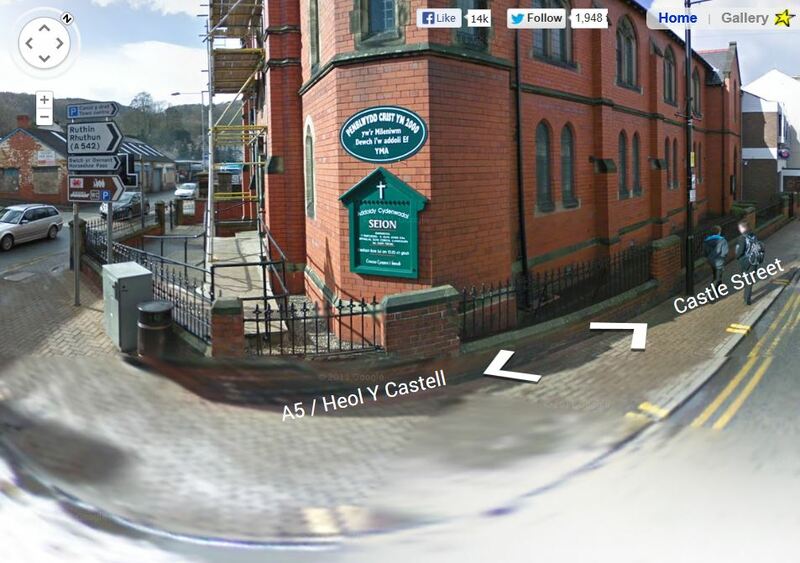 So I took the right down Castel Street, and then a left down Market Street. Except it didn’t bring me to a train station. 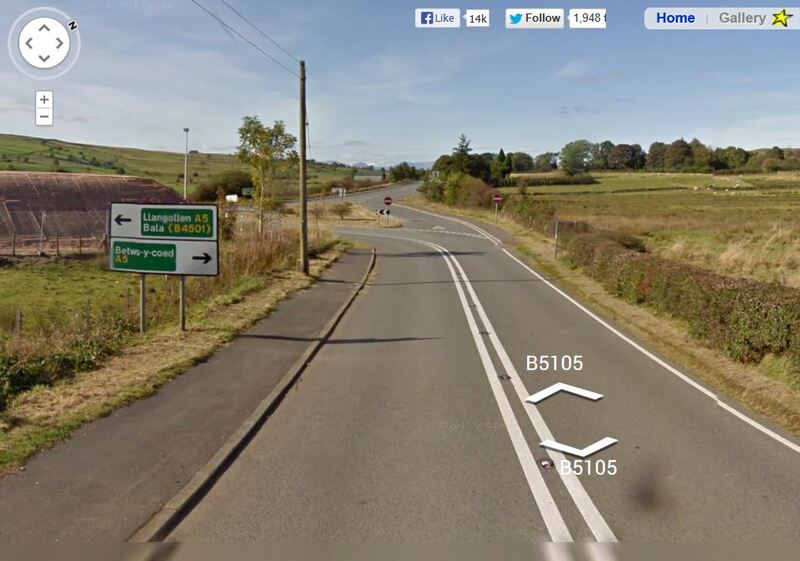 It brought me in a giant loop, and I ended up back on the A5. Stupid signs. Somewhere along Market street I should have turned for the train station, except someone forgot to put up a sign saying that. Dumb. Oh well. Guess I’m stuck on the A5! OH MY GOODNESS is that an airplane sign?!?! *sigh* Of course not. It’s a cross. Gosh darn it. A marina? As in, like, a harbor? On the coast? Perhaps this is worth a detour . . . Except at that point my computer decided to shut down and install updates. I lost this page, not to be recovered. So what did I do? I pulled out my book of Great Britain that I had gotten before my trip to England, just to look at the map of Wales and try to figure out where I was. I thought Googling just felt too much like cheating, after all the hard work I had put into this. But guess where I was? 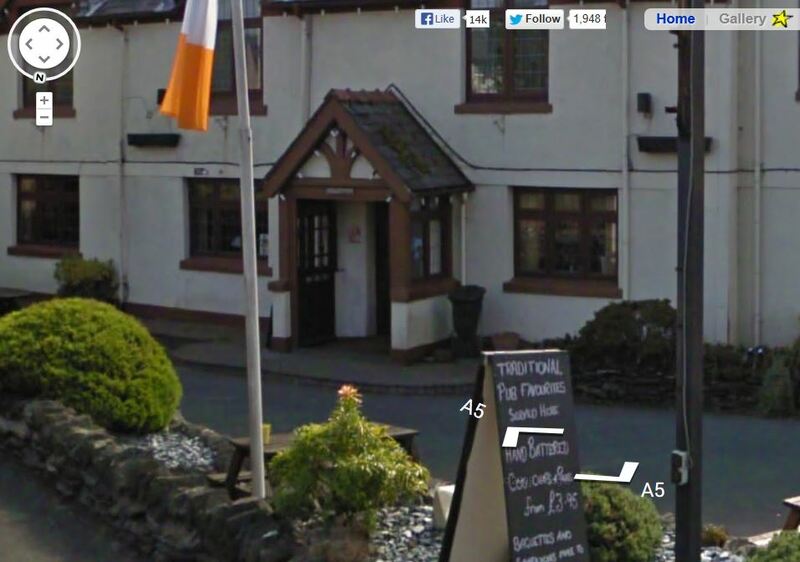 The whole time I was “travelling,” I was in north Wales. And I mean like, super northern tip. 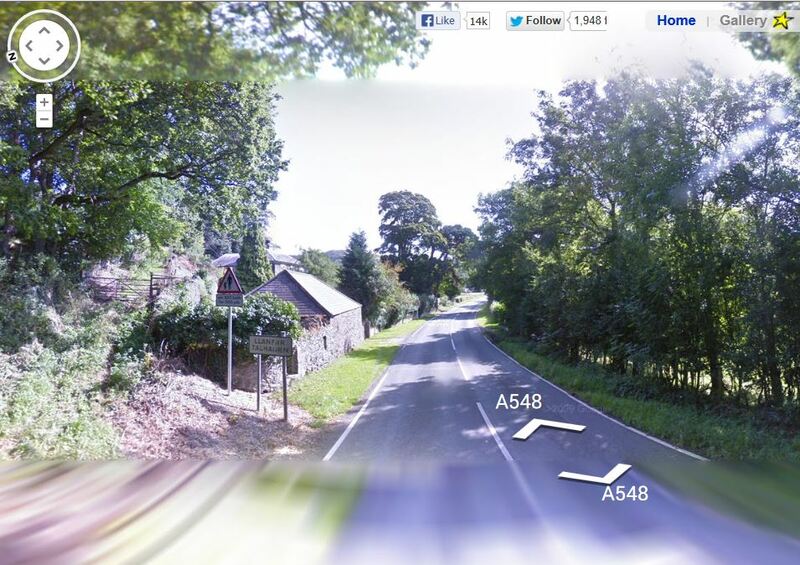 I was closer to Liverpool and Manchester than I was to Cardiff. And honestly, I was heading in the more in the direction of Manchester than Cardiff. Or at the very least, Birmingham. If I had taken that route towards Chester, I actually would have been on a good path. 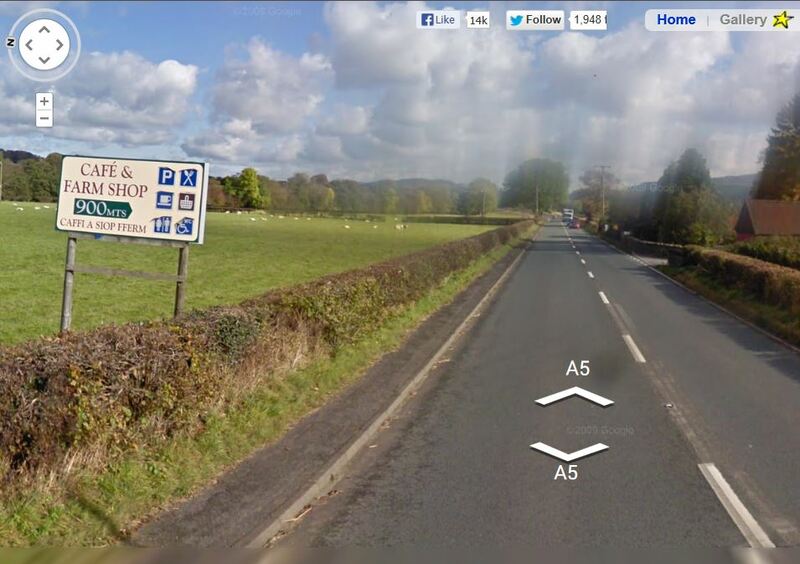 It was actually the same Chester I was thinking of, and it was actually that far north. Also, it takes wayyy longer to click through a road then it does to drive it. You know how many miles I travelled? Thirty-eight. It should have taken me less than an hour to drive it in real life, whereas I spent an embarrassing amount of hours trying to play this stupid game. It would have taken much too long to get to Cardiff at that rate. I never would have made it. Not virtually, anyway. If I had continued playing, then I would have come to a major motorway pretty soon, the A483, which I probably would have taken because the A5 ends, and the A483 goes south. 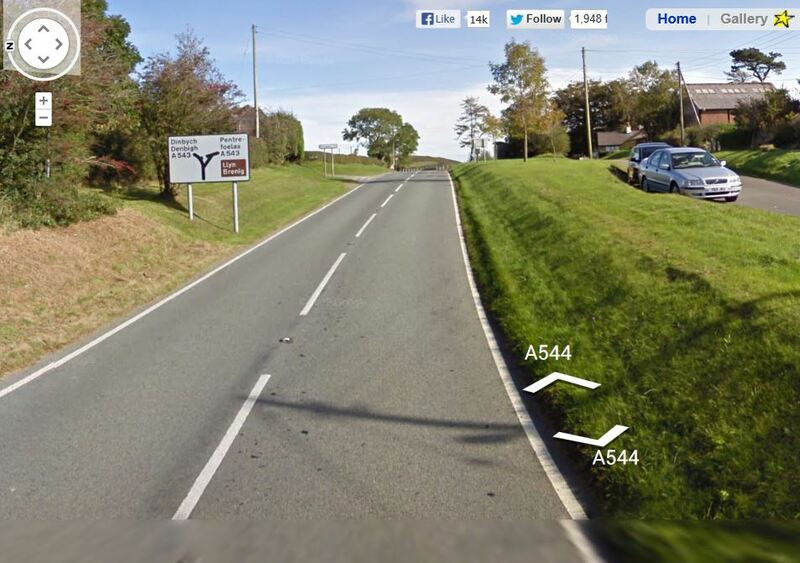 If I had followed that to where it merged with the A470, I would have ended in Cardiff. But really, if this had been real life, then I would have at the very least stopped at the nearest train station, bought a ticket to the nearest city (which probably would have been Liverpool, or Manchester), and gotten a plane from there. So I’m going to go with that, and say that I won. Because I found not one, but two train stations. The moral of the story: this game is utterly pointless. Except, of course, if you suffer from a case of Wanderlust. In that case, then this game is just what you need to “wander” through the unfamiliar streets of a foreign land, imagine what it would be like to stop at all the touristy (or not so touristy) spots, and then be reminded that there is no place like home. Don’t be surprised if I attempt this game again. Although I may only try the “urban button.” No more of this middle-of-nowhere nonsense, even if it was wonderful to “see” the UK again. I do miss Europe. Nothing will ever be the same. But, all the same, it’s good to be home. Perhaps this is a random observation, but I’ve always loved how in Disney’s Electrical Parade, there is a “bridge” float between Cinderella and Peter Pan. It’s the simplest float because it’s simply a giant tolling clock. The hands are at midnight, symbolizing the infamous time of transformation in Cinderella, but it’s also the same clock that Peter and Wendy land on before flying off to Neverland (it’s Big Ben, in case you never noticed). But as I watched the parade last night for like the hundredth time this summer, it struck me just how important that clock is. In both movies, the clock symbolizes that no matter how hard you try, time moves on. Cinderella couldn’t spend all night at the ball, and Wendy had to face the fact that she needed to grow up. And it’s a fact that we have to live with. None of us can spend forever doing something. We need to grow up, move on, and accept change. The clock in the parade is just a simple reminder that although you may have just had the most magical day (or week, or month, or summer) in Disney world, it’s the end of the day, and it’s almost time to go home. For the second time in 6 months, I have to say goodbye to a whole group of friends that I don’t know if I’ll ever see again. Sure, I’ll be back to work at Disney in a few months, but it will be with a whole new group of college-programmers. Once again, I’ll take the time to get to know them, and once again they’ll leave. Three months isn’t nearly enough time. But as the summer winds down, I know that with the end of summer comes a beginning as well: the beginning of school. Although even that is an “end” . . . but I won’t talk about graduation yet. It’s far too soon for that. In Peter Pan, the movie begins with Wendy’s father telling her that she will have to stop sleeping in the nursery, as it’s time for her to grow up. She fights this fact by flying off to Neverland with Peter Pan. In Neverland, time seems completely irrelevant. In the same way, Disney is a place where time seems to stand still, and perhaps that’s why so many people like it. For a brief period of time, you are reminded of what it feels like to be a kid again, and for children, it feels like Neverland. You are there without a care in the world. Disney places you in a continual state of wonder, hope, and happiness. (Unless of course you’re confronted with a screaming Brazilian tour group, but I promise I won’t rant on that monstrosity.) And for cast members, especially those of us who only spend a brief time there, Disney often feels like a wondrous thing that will never end. Time seems like an irrelevant detail. But nonetheless, as the clock reminds us, time does inevitably march on. And sooner or later, we’ll have to face its toll. Summer is nearly over, and it’s time to go back to “the real world.” It’s time to go back home. I’m not sure that I got all that I possibly could have gotten out of the summer, but I’ve certainly tried my best. Although it’s gone by quickly, it has also been filled with happy memories that I’ll never forget. Because you know, when you wish upon a star, it makes no difference who you are. When you wish upon a star, your dreams come true. So I suppose it’s time to make a wish, and do as dreamers do . . . Most people have discovered this, but there’s something special about Disney. There’s something that sets Disney apart from other parks, something that is more than just fast rides and cute shows. There’s quite literally something magical about the effect Disney has on a person. After being gifted with the priviledge of experiencing the parks with many people (both first-timers and old hats), I’ve started to notice a pattern that I call the “DisneyTransformation” that affects people from the moment they step off the monorail. It all starts with a mouse. Walt Disney would have been nothing without his faithful pal Mickey Mouse, and so Disney World is a living testament to the big cheese himself. No matter how you feel about Mickey when you enter, you leave with a deep appreciation for him. So much so, that it’s almost impossible not to want a pair of Mickey ears for yourself. You come craving rides, but you leave craving stories. The first question I get asked on a typical outing to Disney is, “What rides are we going to go on?” In today’s day in age, we crave things that are bigger, faster, and more exciting than average. We’ve come to expect a high qualiy from Disney, so many first-timers assume that means that Disney rides are just bigger, and faster, and more exciting. But what truly makes each ride special is the story behind it. The detailing of each ride is what makes it come to life. It gives me goosebumps when I’m able to watch an 8-year-old go from, “I want to ride a rollercoaster!” to saying, “I bet Peter Pan designed that ride. He had to. He wanted people to know how to fly, so he made us pirate ships that flew to Neverland.” It’s the story that really makes the ride worth riding. You start wondering how Mickey can actually get from one place to another so fast. Because there’s obviously only one Mickey. How could you ever have thought otherwise? I mean, if there were two Mickey’s, then one of them would be an imposter. And we can’t have that in Disney World. Mickey is the boss. He runs the show. He is the only one. And you finally firmly believe that. Once you can accept that there’s only one Mickey, it opens up a world of new ideas. Like, meeting the princesses sounds like a completely valid way to spend an hour and a half of the afternoon. It’s not as weird as it used to sound, and totally not just for babies. Meeting characters becomes a new obsession. You accept the fact that it’s totally normal to see Tigger bouncing through Fantasyland. No matter how much you complain about being hot or tired or uncomfortable, when presented with the option to leave you definitely don’t want to. Because even complaining is better than leaving the magic behind. Hearing your guests ask those words after a long, hot, exhausting day is probably the most rewarding thing that a cast member host can hear. “When are we coming back?” It means so much in just a few words. It means that the transformation has successfully taken place. It means that my guests, no matter how old they are, have been captured by Disney magic, that they have found something here that they are sad to leave behind, and most of all it means that there’s at least a little part of them that appreciates all the hard work that cast members do to create the experience of Disney. Maybe that person won’t thank every cast member they meet, but every cast member deserves a thank-you for participating in a magical day. It might not have been flawless, but at the end of the day you know it’s been a successful trip when all of the minor setbacks have been forgotten. The only thing left is the magic, and although that magic may wear off in the “real world,” you know it will always be there at Disney, waiting to welcome you home again.